If you love the spa experience at the comfort of your home, you’d better include space for a hot tub in your patio design. Be sure to consider whether or not you’d like your upcoming hot tub to be in-ground, or above your deck. If you’re opting for a raised hot tub, you might want to build a staircase into your design. Also, consider adding a privacy fence or lattice around your hot tub. Leave space for the cover of the tub, and most importantly, designate a spot to hang your towels! Seats are a necessary part of your patio and deck. Sure, you can always opt for lawn chairs—they are portable, which is a plus. Or, if you prefer, you can build seating into the structure of the deck itself. Tack a bench onto the edges of your deck, or build in sunken seating that surrounds a fire pit. If you’re going to go with patio chairs, be sure to leave plenty of space to place your furniture. If you have have a green thumb, you can incorporate planters into your deck design. If your deck is raised up off the ground a bit, you might want to add planters cascading around the outside edge of your deck. Take note, if you have a wooden deck in mind, you’ll have to design around your planters to keep the deck from rotting, since you’ll have to water your planters often. There’s no better feeling than enjoying a crackling fire with friends while roasting marshmallows and watching the sunset. 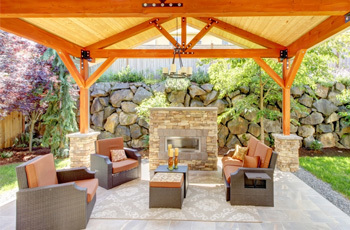 Why not make the most of your patio with an outdoor fireplace? Everyone ends up around the fire as the night rolls in. Consider the materials of your patio and the pit—do you want to use stone for both your patio and your firepit, or would you prefer to mix it up? What View Are You Focusing On? What’s the best view from your home? 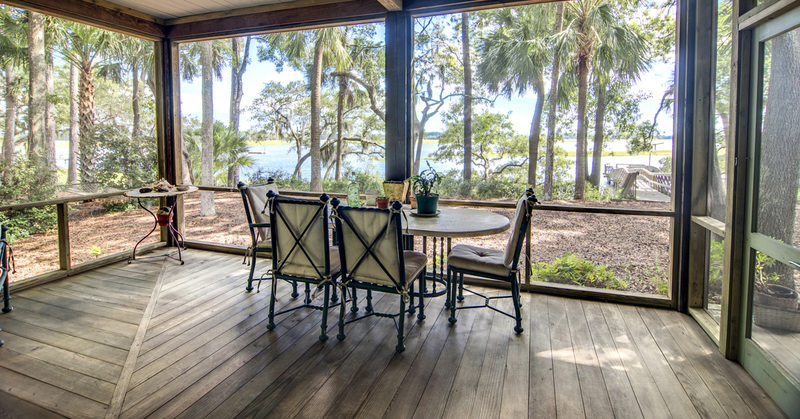 As you design your patio, it’s time to make the most of your view. Make the most of the cityscape, the trees in your yard, and the sunset (or sunrise) by designing your patio to accommodate those views. Now it’s time to choose the materials you’d like to utilize for your deck and/or patio. If you’re putting in a patio, you can choose from concrete, stone, brick, and pavers to construct your outdoor oasis. If you’re opting to build a deck, you can choose from wood and composite materials (such as Trex®). Each material has its merits. Trex, for instance, is affordable, long-lasting, and maintenance free; meanwhile, wood provides a more natural look and feel, but it will require continual maintenance throughout its lifetime. When selecting a material, it’s good to consider your home, your landscape, and other surroundings. If, for instance, you have a brick home, a brick patio may tie in with that theme nicely. Or, perhaps you have a home with exposed timber framing. You can continue the motif with rustic timber framing integrated into your deck. In addition, you can consider the pattern of your deck or patio. With deck materials, you can lay in angular patterns, shapes, or even Celtic knots. If you’re designing a patio with pavers, brick, or stone, you can incorporate circular patterns, curvilinear designs, or more traditional, perpendicular line patterns. With patio and deck patterns, the options are limitless! DrafterMax is your Brooklyn-based design and drafting firm. We provide a variety of drafting services, including architectural drafting, 3D rendering, and creating as-built drawings and shop drawings. Count on us to see your design through from start to finish! Feel free to get in touch with us if you have any questions, or if you’re ready to get started, you can acquire a free quote!